What is Selenium 2 Testing? Selenium 2 is the testing tools guide which is based on an integrated development environment (IDE) for testing and measuring the website and web pages quality as well as for recoding, debugging and testing the interactive soft-wares that works or designs for web based environment with the aid of automation. It is a portable testing framework as per authenticated by most of the software engineers and experts that is primarily designed for web based applications. Selenium 2 testing tool is in-fact an extended version of Selenium IDE which provides more ease with greater automation of testing, recording and debugging web based and related applications. Users of this testing tool are not required to become expert in test scripting languages first then starting to grip on Selenium 2 testing tool. Selenium 2 testing tool has universality in terms of its usage and application in different operating systems of computer. It is equally operational in Windows, Linux or Macintosh which provides ease and variety to its users for running it in different environments of operating systems. Selenium 2 testing tool is an advanced module of Selenium IDE which also provides ease in not just test measurement but also in writing tests in Selenese environment. It has greater flexibility in writing tests by providing the integrated environment and import of tests through API mode that have been written in other programming languages such as Python, Java or C#. Selenium 2 testing tool can be supported with multiple browsers likewise Firefox, IE, Google Chrome or Opera by enjoying remarkable features of including the playback testing, recording, auto completion of the most common commands for the Selenium, intelligent selection of fields by using XPath, IDs and names, walk-through tests, measurement and break points checking and debugging etc. Selenium 2 testing has enhanced features of working with mobile devices especially which are based on Android and Apple iOS. This tool is also worked with greater accuracy and synchronization of HTML5 for browser connection checking, web storage and status verification in online and offline environment. Selenium 2 testing certification program from Brainmeasures is the most valuable and suitable online certification program which will enable you to become more proficient and skilful in Selenium IDE, its testing requirement, universality, harmonization and synchronization with other web based applications and programming languages. This Selenium 2 testing tools is a unique and compact certification program which will enhance your expertise and efficiency in terms of testing, measurement, checking and debugging in web based applications as well as effective use in different operating systems with multiple plat-forms of web browsers. After gripping on testing tools and know how about setting and debugging, candidates will further learn and practice in advanced topics of Selenium which are beyond to IDE and API environments which includes capturing screenshots, capturing base64 version of images and how to convert and save them in bytes and files. Furthermore, you will also be able to hands on using of XVFB server setting, testing and its application with Selenium as well as detailed procedure of migration from remote control to web driver. 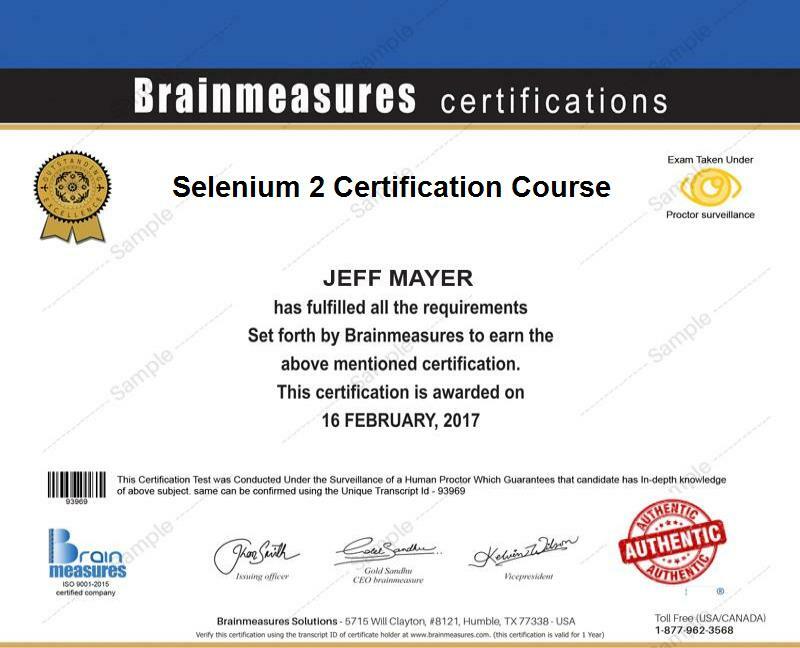 This all requires to get yourself enrol in Brainmeasures’ Selenium 2 testing in order to get certification as equipped with Selenium expertise which will not only add in your Resume but also cause to increase you salary and chances to get promotion in your career path. Entitlement of selenium tester, engineer, technician or analyst by the help of this certification program does not cause to develop and increase your expertise but also translates to increase income and salary levels. The average annual salary for those who hold designing, engineering, IT auditing, developing and selenium expert positions in an organization is $65,000 per year which can be grow in between $95000- $160000 based on level of experience as well as reputation of the employee and organization in the relevant field. This certification program of Brainmeasures require some technical knowledge and expertise in web based environment but enrolment is open for all learners who are eager to enhances their competencies in the testing tools in Selenese environment. Selenium 2 testing is designed for software engineers, developers, software auditors, IT managers, QA and QC developers and engineers as well as individuals, professionals and corporate players who wish to understand about Selenium, its IDE and API applications with enhancement testing skills.